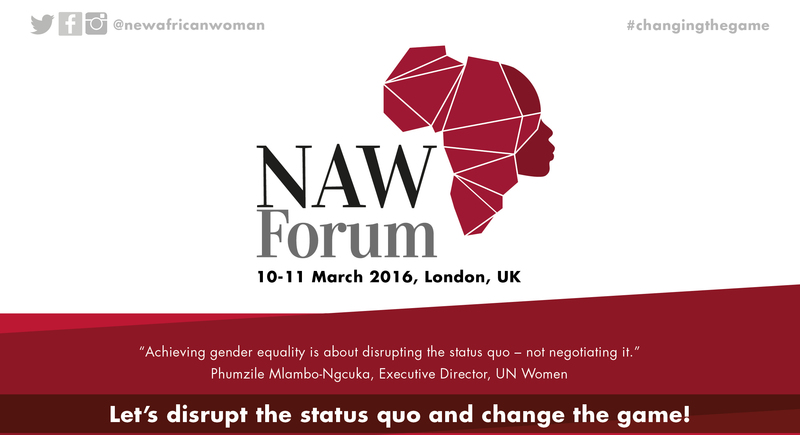 New African Woman Magazine is pleased to announce the launch of their first edition of the New African Woman Forum, which will take place on March 10-11 2016 in London. The forum will be accompanied by the New African Woman Awards, a gala dinner to recognize Women leadership and excellence on the continent. The winners, voted by the New African Woman magazine’s readers, will be announced during the Awards ceremony. African Women have been instrumental in shaping the African society and are an important force for development as consumers, mothers, employers, employees, leaders and entrepreneurs. Statistics have clearly indicated the direct correlation between the prosperity of a nation and empowerment of women. However, the progress made to enhance gender equality has been rather slow and this in turn has affected ability of the continent to achieve its full potential. The central questions remain: How can we reinvent leadership in Africa with women and youth to ensure we meet Agenda 2063? How can women be part of the citizenry that is driving the continent’s development, when they are the least employed, least empowered, least healthy and have the least food security? How can Africa fulfil its potential and become a dynamic and credible force in the global arena, when more than half of its population is disempowered? The New African Woman forum will bring together over 150 leaders from business, academia and civil society, as well as key decision makers from the public and private sector. Themes will be centered on the reality of African society, while taking advantage of the perspectives of the New African Women that have not yet been highlighted or valued in the current analysis or strategic process. Through a combination of panel discussions, case-study presentations and networking breaks, the Forum will offer a unique platform to meet, network and share the challenges, experiences and success stories of the African Women who are changing the game on the continent. Media Debate: Can you hear me?